Herkybirds nest: Victory in sight? Today, we had a game of Napoleonic Sails of Glory! 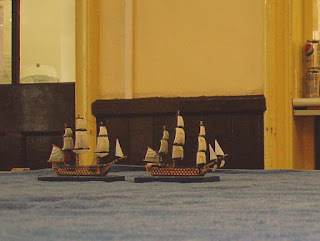 As we were down to 3 players, we had the French run by my 'Powder Monkey' solo rules , and we ran 3 Royal Navy ships, including my new HMS Victory. The French, the '74 Genereux leading, followed by the 1st rates Montagne and Commerce de Marseilles. 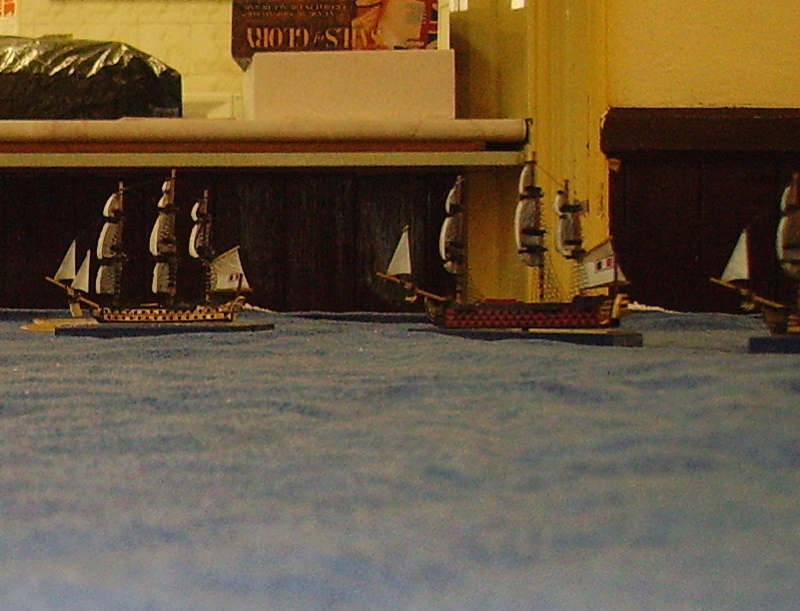 The players, Phil's HMS Victory, leading HMS Hibernia (Lawrence), and lastly my HMS Vanguard, a lowly 74 following the 1st raters. The new HMS Victory, Phil was not using any of the extra rules for her! The French, as per the solo rules, headed close to the wind, trying to get upwind of us. The English ran parallel to the wind, but started upwind of the French. The French would only start maneuvering when within 2 cannon shot of us. The French would start maneuvering if within 1 cannon shot of the table edge, they wouldn't just sail off the table! The English stayed in formation and straight ahead, though Phil signalled for us to reduce sail. Once within 2 rulers of the English, Genereux and Montagne started dicing for maneuver, though the one turn delay before playing the card meant they continued on course for now. ...and the dice determined which maneuver card was played. Montagne turned to port, while Genereux just side-slipped! Victory fired a forward salvo against Genereux's broadside. Despite this, Victory got the better of the exchange! Genereux lost 2 boxes, and 2 crew, but worse, had a fire on board! HMS Victory lost 1 hull, 1 crew, and had some minor sail damage. Genereux's crew tried to douse the fire as it spread. As Victory sailed on reloading, Montagne and Commerce combined their fire on her! Victory took mast damage and lost a lot of crew. HMS Hibernia got a broadside against Genereux, while she was reloading. The damage was severe, including mast and rudder damage, and a leak. I managed to get my 74 in position to bow rake Montagne. The damage was mostly on mast and crew, but caused a leak as well. Montagne had her marines in the rigging, unlike me, and shot down 2 of my crew! The neat squadrons were breaking up! Montagne stern raked Hibernia, damaging her rudder, rather appropriately! HMS Hibernia now traded shots with Commerce de Marseilles, which lost a lot of crew. Hibernia had a fire and sail damage. So, how did the ships look at this point in the battle? Montagne stopped her leak and the crew hurriedly got their ship back in order. Commerce was virtually untouched, but her crew was reduced. Genereux was virtually a wreck! My Vanguard was moderately damaged, but still fightable. HMS Victory was seriously damaged, but was stabilised. HMS Hibernia was lightly damaged, but had a fire to fight. Now, My Vanguard and HMS Victory combined to blast Montagne. My bow-rake in particular was very damaging, causing 2 leaks. The damaged Montagne managed a small, but damaging broadside on Victory as she passed. HMS Hibernia was now out of the main arena of battle, and was chased by the crippled Genereux! The French were bringing their ships back together! As the English closed from both sides, Montagne shot both broadsides! HMS Vanguard suffered a fire damage, HMS Hibernia just a single crew casualty! HMS Vanguard was now looking less happy! HMS Victory was 'In Irons' in an attempt to return to the fray. HMS Hibernia was, amazingly, still only lightly damaged! Commerce was still fighting fit, apart from some crew losses. Montagne was fairly damaged, and was struggling to get leaks under control. The less said about poor Genereux, the better! ...sending poor Genereux to Davy Jones locker! Commerce de Marseilles got a bow rake on Hibernia in vengeance, causing a fire and a leak, as well as a fair amount of damage! Hibernia and Montagne now engaged, Montagne taking the most serious damage. My Vanguard tried to join in against Montagne, but I lost badly. I was lucky just to lose 1 hull box! We decided to call it a day here, both sides were badly damaged, and honour was served. ...Commerce was still in good condition, though like Victory, had large crew losses. This was a very close game, and we were lucky our shooting was generally more effective than the French. Sails of Glory is a fun game to play! Good looking game, good read always like naval games when I play them. Thanks Francis! - I, too, like Naval gaming. It was a friend with his balsa wood ww2 ships that got me into wargaming on the late 60's! That was bloody. Must read through all your rules Richard. I like the 2 rulers and 1 ruler bit before dicing. I hope you like Powder Monkey, it seems to give us a good game! http://tynesidewargames.co.uk/downloads.html is the link to the solo rules, of course!